Hello friends, today we are going to discuss how to use whatsapp on Pc or on your laptop without using bluestacks or any other android app simulating software. We all know that whatsapp is one of the most popular messaging application which is available on all smartphone platforms. Have you noticed that whatsapp is becoming so much popular that nokia has also launched whatsapp on their Lumia series. After reading todays article people who want to enjoy whatsapp on their Pc or in laptops can able to do easily. If you are from those people who want to install whatsapp on their Pc without installing any other android simulating software then you are in the right place. There are lots of reason for not using any type of android app simulating software for running whatsapp. One of the biggest reason is that you need high system requirement for using these types of android emulators. Sometimes these types of softwares also need a graphics card. But no need to worry at all if you don’t have graphics card installed in your system. After reading this article carefully you will be able to enjoy whatsapp easily without any type requirement of graphics card. You just need to have windows XP, windows 7 or windows 8 operating system installed in your system, one mobile number and of course an internet connection.So keep scrolling down and find out that how can you use whatsapp on your Pc without installing any other app player. How to run whatsapp on your Pc without any emulator ? To install whatsapp on your Pc you need to first download whatsapp on your Pc. Wassapp is an unofficial version of whatsapp which helps you to enjoy whatsapp on your Pc easily without taking help of any other external app emulator. Wassapp is much smaller in size compared to whatsapp. This software need no special kind system requirements. Also this software is fully trusted and checked by all antiviruses. How can you install whatsapp on your Pc ? 1. FIrstly you need to Download Wassapp from Windows. 2. After downloading this software kindly install it in your Pc. 3. Now open Whatsapp and enter your mobile number and password. 4. Then click Register. If you are already available on whatsapp then you need to just Login your id and password. 5. Thats all. You can now able to enjoy whatsapp on your Pc/Laptop. Note: I will be recommending you to create your account through your smartphone and then you can login in wassapp. I’m saying this because it happens most of the time that Whatsapp shows some kind of error. But overall it is an excellent software for using whatsapp service on your system. Hope, that you have enjoyed my post how to use whatsapp on pc without emulator this tutorial. If you have any type of doubt while reading this article then you can surely contact me. At the last don’t forget to share this amazing trick with your friends. First, I’d like to thank you for this post, and I’d like to know if there is any possibility of configuring a proxy option for this app (wassapp), otherwise I would have to set it up in my Connection settings via Internet Explorer. step 3. is it whatapp or wassapp? then, my phone is ordinary one. 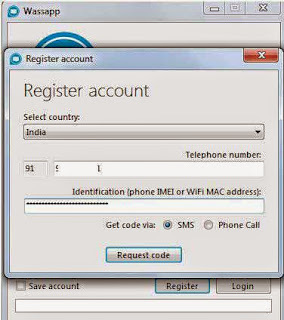 but i have used the number earlier with bluestacks.now how to register it with wassapp. i could not register the number. kindly help. thanks. great post thanks for sharing this useful information with us ! !